Having grown up in Washington State, I've been a Seahawks fan since I was an infant. Unfortunately we have had to put up with our coach's ill-thought-out comments which have drawn truther interest. 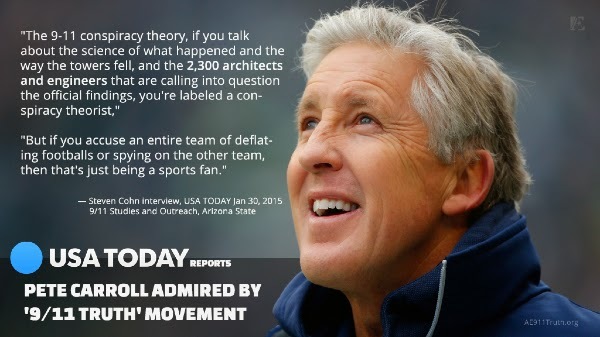 Pete Carroll is a conspiracy theorist, at least that is how the conspiracy theory goes. 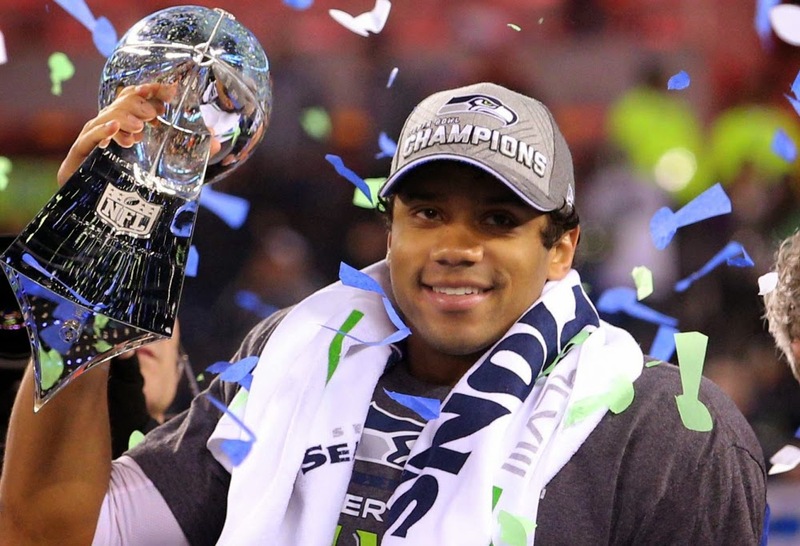 And it is one that has gained the Seattle Seahawks coach an unlikely following from the "9/11 Truth" movement in the lead-up to his attempt to win back-to-back Super Bowls. Two years ago, Carroll met with former Army chief of staff and four-star general Peter Chiarelli and, according to Deadspin citing "sources," brought up many popular conspiracy theories concerned with the attacks of Sept. 11, 2001, on the World Trade Center and quizzed Chiarelli about their veracity. Yeah, keep your silly speculation to yourself coach. Leave the super-sekrit-magico-nano-thermite to the Truthers. The only explosions that matter right now concern the Legion of Boom. AE911Truth is latching on to this idiotic quote as part of a mailing campaign. Of course they are missing the obvious difference, that deflating the footballs, if it even happened, would quite simply only require the cooperation of one or two people, quarterback Tom Brady and the equipment manager. Various permutations of Truther fantasies however require the complicity of the military, several intelligence agencies, the FBI, the NYPD, the Secret Service, dozens of explosives technicians, much of the media, NIST, Congress, various members of two presidential administrations and the terrorists themselves. In fact entire sections of the University of Phoenix stadium itself could be filled to capacity with the conspirators. Of course, the miracle passport did nothing of the kind; it was merely one small bit of evidence in a much larger chain. As for the column run by RPI, it was written by Paul Craig Roberts, PCR is a a former Assistant Secretary of the US Treasury and former associate editor of the Wall Street Journal. WSJ is, of course, considered by those in the know, the War Street Journal, i.e. an outlet controlled by the neocons. And PCR was an assistant Treasury Secretary during the period neocon favorite Ronald Reagan was president. So what? Roberts is a nut. As a reminder, Barbara Honegger was in the Reagan Administration too; she's also flipped her lid (actually in her case she showed signs of being wacko beforehand). And at the $25 per month level, you’ll receive, in addition to the documentary DVD, this gem of a framed photograph, signed by me and two renowned 9/11 researchers, Dr. David Ray Griffin and Dr. Steven Jones. You know how it is; if he really had evidence that the government had foreknowledge, he would have his lawyers reveal it prior to the trial and create a sensation. Instead I expect the attorneys to negotiate some sort of plea deal, which of course the Truthers will claim included him not mentioning his 9-11 evidence.